Set with a mixture of rose cut diamond shapes, this Nina Runsdorf band is modern and bold. 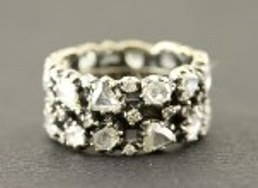 The 18K white gold setting is oxidized to allow the diamonds to stand out and give maximum sparkle. Abstract and ultra-modern, this Gelner diamond pave necklace is a meant to catch attention. 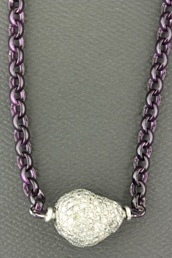 The free-form pendant is encrusted with 4.60cttw of round diamonds, while the chain is a sturdy link style made of sterling silver and enameled a deep maroon. This piece will never be understated, no matter how hard you try! 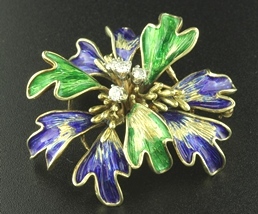 This signed Cartier piece is alive with bright green and blue hand applied enamel and four round brilliant center set diamonds totalling .31cttw. 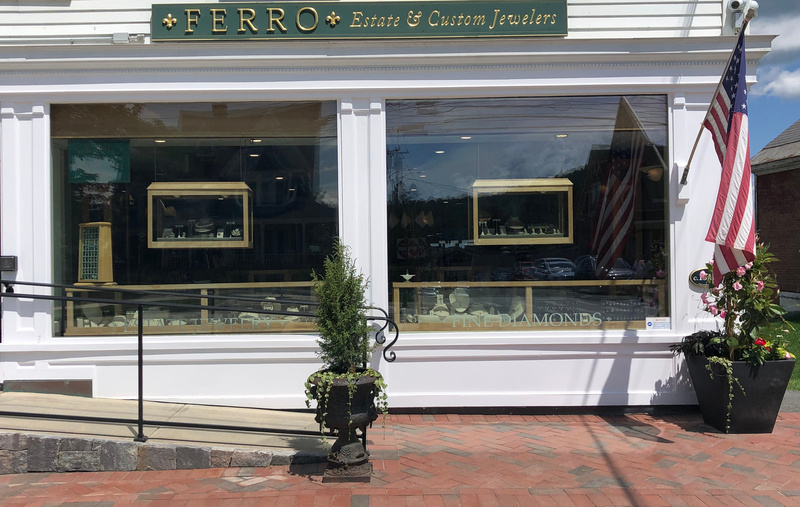 Cast in rich 18K yellow gold, this brooch is a true work of art. A striking piece by designer David Yurman. 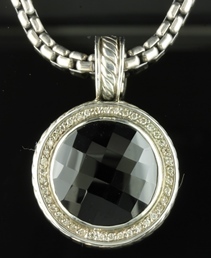 This pendant is crafted in fine sterling silver and set with an onyx at the center surrounded by single cut diamonds hanging from a unique interlocking link chain. From the authority in cultured pearls, this brooch is inspired by the cherry blossoms of Japan after a evening snowfall, these high quality salt water cultured pearls will glisten in front of your eyes. 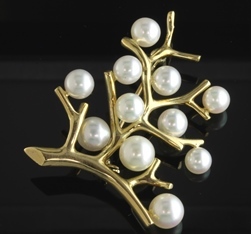 Set on a 14K yellow gold cast tree branch brooch, the luster and orient of these pearls is second-to-none. A toast to great times and company! 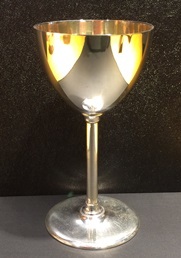 Make any occasion exceptional with these Cartier sterling silver and gold wash goblets. Signed and individually numbered. Available as a set of nine, or try just two to start your collection.